I booked a table a week in advance. Actually the first thing I did in Rome was buying a local sim card. Mainly to be able to make table reservations in restaurants I was desperate to visit. These were Roscioli (mainly for burrata cheese, pasta carbonara and pasta amatriciana), l'Archangelo (for suppli and gnocchi), Da Remo (for pizza margarita) and Roma Sparita (only for cacio e pepe). 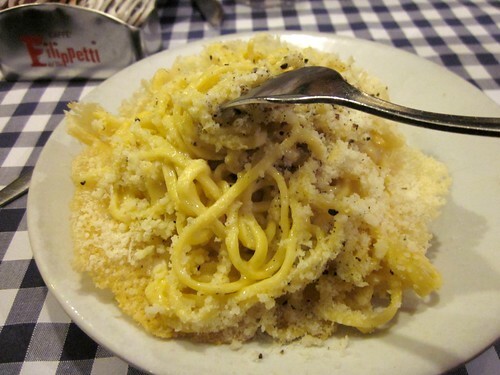 Roma Sparita is famous for making the best cacio e pepe in Rome. I was dying to go since I watched Anthony Bourdain's video about them making this pasta and serving it in a freshly made pecorino shell. 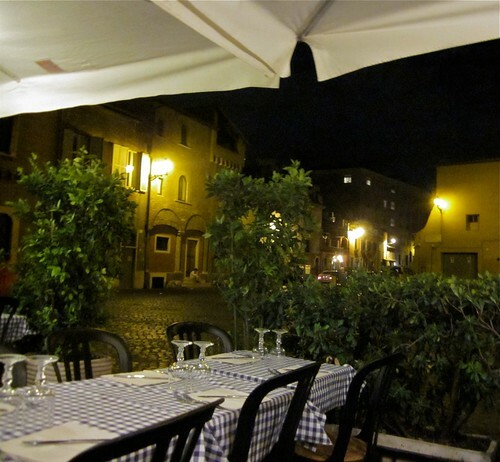 The restaurant is in the corner of a lovely little square in Trastevere. That evening everything around looked so ancient and beautiful as if we entered a tale. We got seated. Outside (Roma Sparita has no inside space). My mom was feeling unwell and asked for a cup of black tea. I felt sorry for the waiter looking at his face, handsome, very Italian and falling. Oh my, now I see it was actually the same waiter as in Anthony Bourdain's video... He said he didn't have any tea and we settled on a cup of americano (which fortunately worked with mama). I was trying hard to order in Italian and the relationship soon started improving. Deep fried stuffed olives as an appetizer. OK, written down. "Due bicchieri di vino rosso". OK, he will bring us a decanter. 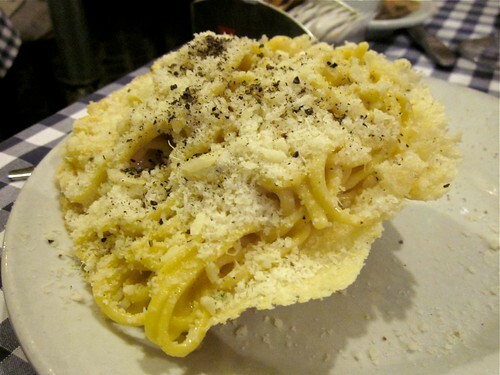 "E due..." - he was already smiling and saying this with me - "...cacio e pepe". I bet every night they serve at least five guests like me, who came there just for it. It was more than I could hope for. The pasta itself - very soft narrow egg noodle. The sauce, sharp peppery and salty with strong pecorino aroma, delicious grey imulsion covering the pasta and the crisp pecorino shell and leaking out of the shell... We went completely off for the next 5 minutes after which the pasta was gone. Having now made it in Moscow a couple of times I know there is something even better than that crispy pecorino shell. This something will stick to the bottom of your pan, once you dress the pasta in it. Mare sure to scrape some off and try. Happily, the appropriate ingredients are available quite easily and the making (as already mentioned) only takes around 10 minutes. As far as pasta is concerned, there are several options. You can use ordinary spaghetti, however I bet in Roma Sparita they use egg pasta. It tastes softer than spaghetti and with this particular dressing I do prefer it. The ideal option would be egg tagliolini 2-3 mm wide. In Moscow they are hard to find, but egg fettuccine (the narrower the better - 2-3 mm is ideal) work just as good. The cheese you need is pecorino romano - sharp extra mature sheep's milk cheese from Lazio region. It has very special taste and aroma and I wouldn't substitute it for anything in this recipe. I use this one (available in large supermarkets) and it does a good job. It also makes sense to get very fresh and fragrant black pepper and you are set to go. Fill a large saucepan with water, add the salt and bring to a boil. Add the pasta and bring back to boil. Cook on high heat with no lid. The number of minutes should be as it says on the package minus one. Reserve two cups of cooking water and drain the pasta. Set a medium pan over low heat. Add 1/2 cup of cooking water and the butter. When it bubbles, add the pasta, pepper and 100 g pecorino. Keep tossing the pasta for 1 - 2 minutes till the pasta is ready and there is a thick grey emulsion around it. If it's too dry, add more cooking water. Serve hot, sprinkled with more pecorino and black pepper. Dry red wine is a perfect complement.